Olga Sidorova was born in Siberia and graduated from the Moscow Circus School, where she specialized in solo swinging trapeze, developing tricks with her coach, Genady Totouhov, that had never been performed before. She toured with the Moscow State Circus and Cirque du Soleil and coached at the National Institute of Circus Arts in Melbourne, Australia. Now settled in Sydney, she is the creator and founder of Dancing in the Air®, an advanced training and creation program which seeks to push the boundaries of aerial performance. 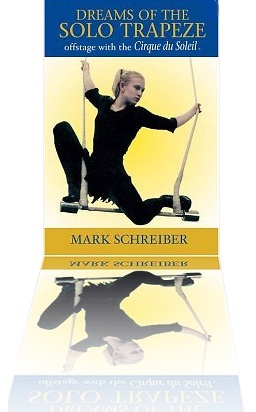 Read more about Olga’s life and philosophy in Dreams of the Solo Trapeze: Offstage with the Cirque du Soliel, by Mark Schreiber. This is the only book ever written about the lives of Cirque du Soleil performers. Dancing in the Air takes place between heaven and earth and reflects the yin and yang of human experience: man and woman, love and hatred, laughter and tears. We evoke a fantasy that is more sophisticated than a child’s dream because we are not just angels flying to heaven but humans coming down to earth again. Circuses started as small family businesses. But this model has changed and the future lies not in performing for children in sawdust rings but for corporate clients, festivals and exhibitions. This means a new sophistication, a focus on adult audiences, and most importantly, performances tailored for specific events to create an emotional connection with the market audience. The approach to coaching at Dancing in the Air combined with graduate qualifications in business, marketing and event management has enabled us to create a series of workshops, programs and tailored consultancy. So we are uniquely positioned to bring the needs of the performer and the corporate sponsor into harmony to create magic in the air.